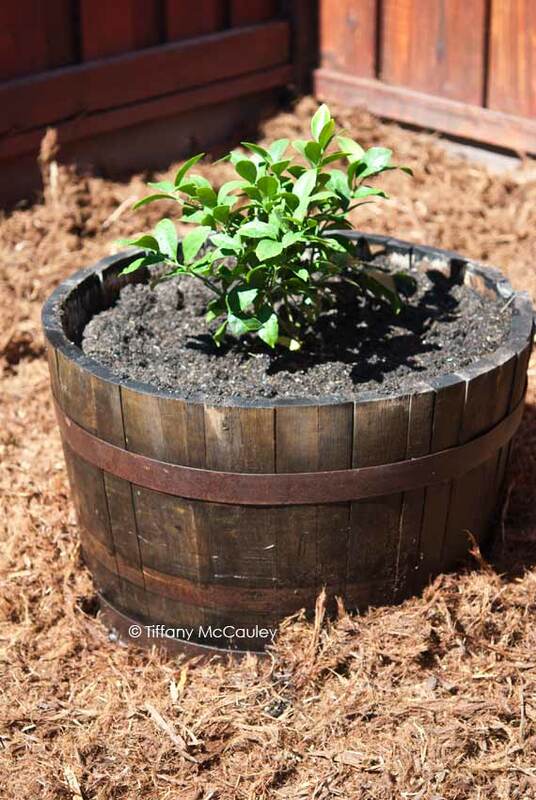 If you have one of those wonderful old, half wine barrel planters in your yard, chances are you know that at some point, the wood can dry out and the rings will fall to the ground. That’s what happened to an old planter my mom had. We actually planned to leave it behind during the move, but the movers brought it along anyway, so I figured I’d better fix it instead of letting it rot away. My mom had purchased a Meyer lemon tree, and we both thought the barrel was the perfect home for it. So we got busy and the above photo is the end result. Beautiful! Sorry for the over exposure in the following shots. It was 100 degrees F. outside, the sun was directly over us and I shot these with my smartphone. I guess it’s not smart enough to avoid overexposure. Won’t make that mistake again! This is what the rings look like. The barrel is missing it’s middle ring all together, so all I had to deal with were the top and bottom rings. To make matters even simpler, the bottom ring was still fully attached. So that left me with just the top ring to get back into place. 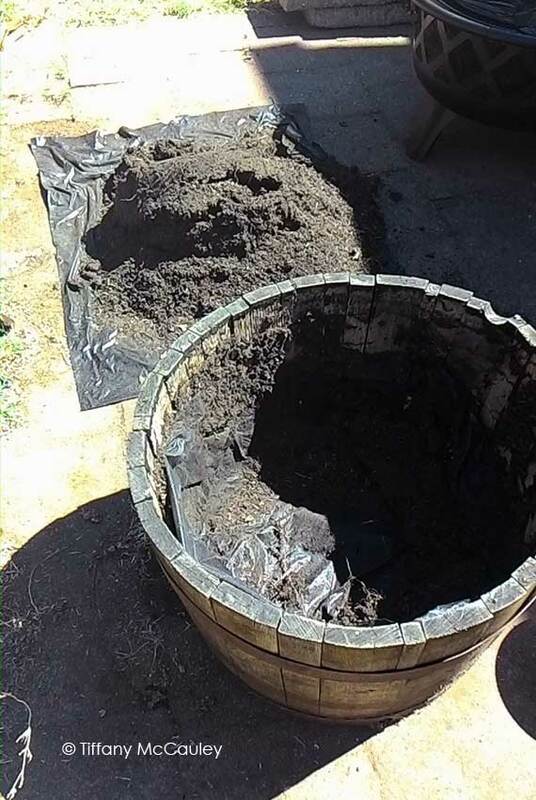 I emptied out the dry dirt that was in there. 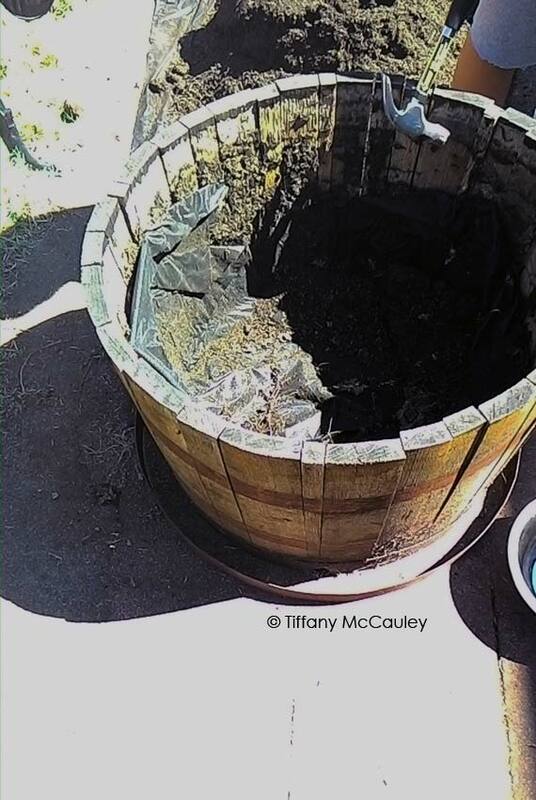 It was pretty easy to remove just by tipping the barrel over carefully so as not to damage the dried out wood. Then a little bit of tapping on the ring with a hammer and large, flathead screwdriver got the ring back into place. And yes, that’s my mom doing the work! She loves these kinds of projects and just sort of took over which gave me the opportunity to take photos! Note that if you try this a few times and the rings just won’t stay put, you can use this step to also gently hammer in a few nails to help the rings stay in place. Just be gentle. Even a few thumbtacks might work here. We then carefully tipped it back onto it’s bottom. Then, if you look closely, some of the boards got a little squished with the ring being pushed up that far. So we gently tapped them back into place, making sure that the ring didn’t fall down again (which it actually did, and we had to do the process all over again. Then we got the whole thing as wet as we could. (Wet part not shown here. I got a little trigger happy with the camera. Sorry! But I promise, we got it good and wet). 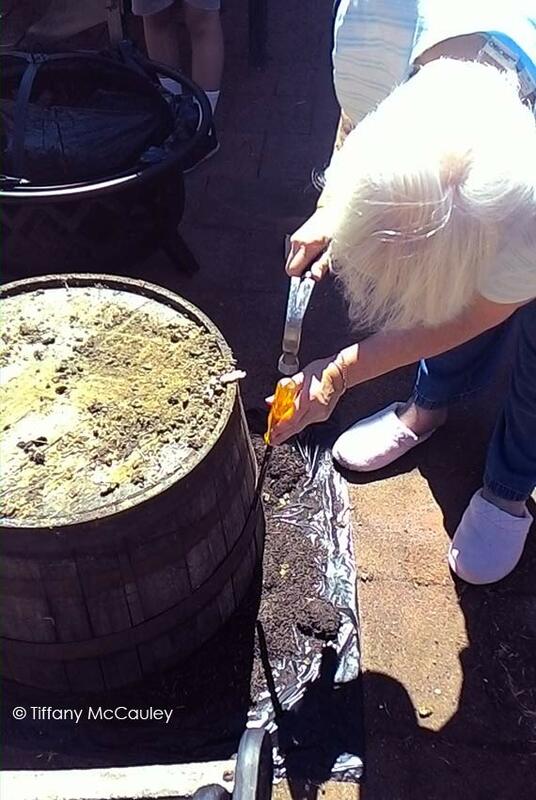 Then we added layers of soil and fertilizer, adding water as we went to ensure that the soil was soaked as well. When you do this, be sure to go a little overboard on the watering because the wood will soak up a lot of the water. Then we planted our lemon tree and ended up with this beauty! 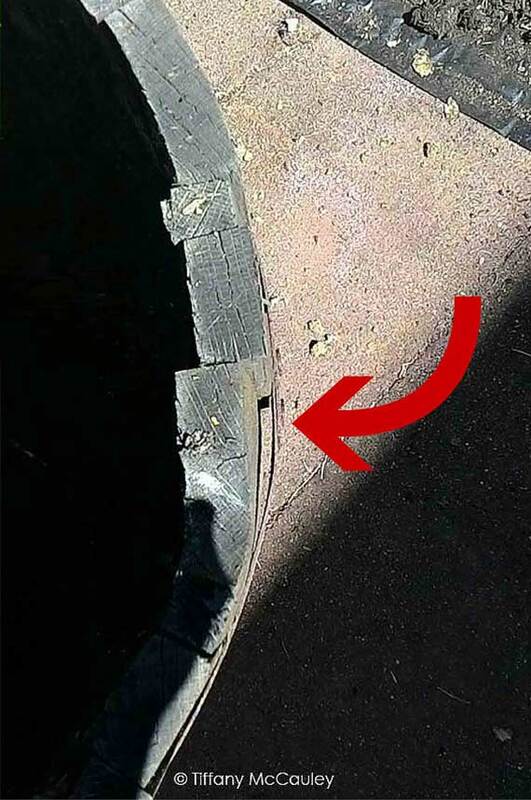 I know it looks like the bottom ring is loose, but it’s not. It’s just the dark area on the wood that is giving it that illusion. Didn’t it turn out nice though? 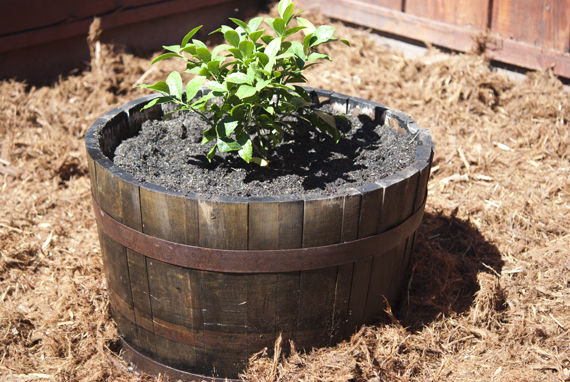 What a great home for a lemon tree!